In a recent Steam community update, Taleworlds has revealed the lore behind Mount & Blade 2: Bannerlord's faction, the Vlandians. The detailed post also includes a behind-the-scene peek at how the team designed the faction's backstory, and their accompanying weapons. The Vlandians are loosely based on the feudal states of early medieval Europe and in particular the Normans, "the Norse raiders who settled in France then carved out kingdoms for themselves in the UK, Sicily, and the Holy Land". As for the weapons themselves? "Vlandian arms and armour are based on that of Western Europe from the 9th to the early 12th centuries," writes Callum. "This was a period of relatively fast evolution, and leaves us with some balancing issues. For example, there are textual references to what appear to be two-handed swords in this period, notably as wielded by Swabian mercenaries at the 1053 battle of Civitate, but as far as we know no artistic depictions or specimens. "Two-handed swords were a popular weapon in Warband, so we're including them - but we're ensuring they're relatively rare, a hero's weapon rather than standard equipment. There's also come controversy about how frequently crossbows were used in the 11th century and before, but we're erring on the side of inclusion. Their use should help the Vlandians be as effective defending fortresses as the Normans were historically." Next time, the blog will feature software engineers and detail how the client and back-end server of Bannerlord communicate. 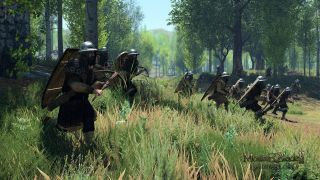 Mount & Blade 2: Bannerlord is, as yet, still without a hard release date, but we enjoyed our hands-on time with its multiplayer at this year's Gamescom.